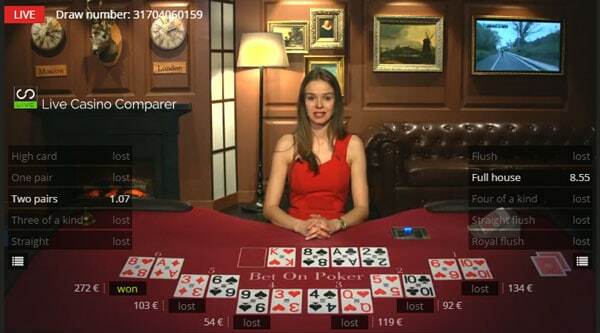 Betgames Bet on Poker - A detailed live casino game review. 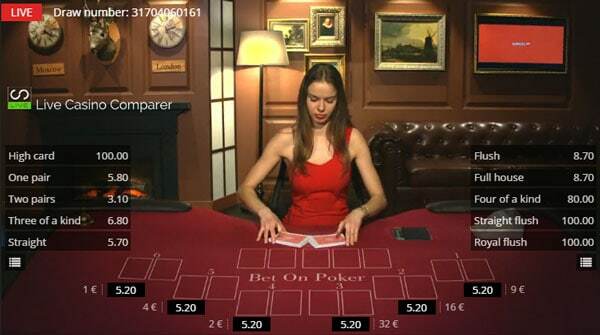 BetGames Bet on Poker is a poker derived game that is played to the rules of Texas Hold’em. The game consists of 6 seated playing positions with a dealer who’s responsible for dealing the cards. One deck of 52 playing cards is used. Unlike Texas Hold’em, you’re not making any playing decisions, all hands are in play until the end of the game round. The only poker skills needed is the ability to understand the ranking of poker hands against each other. This game is all about the betting. While the best hand will win the game, the skill is being able to identify which hand will be the outright winner. 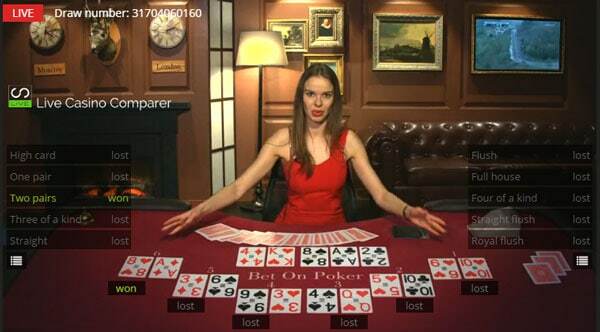 If you’re super skilful you can bet on what you think the winning hand value will be as well. One before any cards are dealt. One after each playing positions gets their two cards. One after the Flop has been dealt. One after the Turn has been dealt. You can bet at each betting round and there are two bets you can bet. 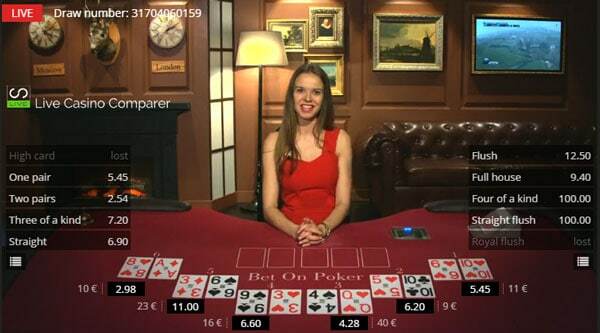 You can bet on what you think the winning hand position will be and also what the value of the winning hand will be. After each round of cards are dealt the odds for each hand and the combinations are updated. 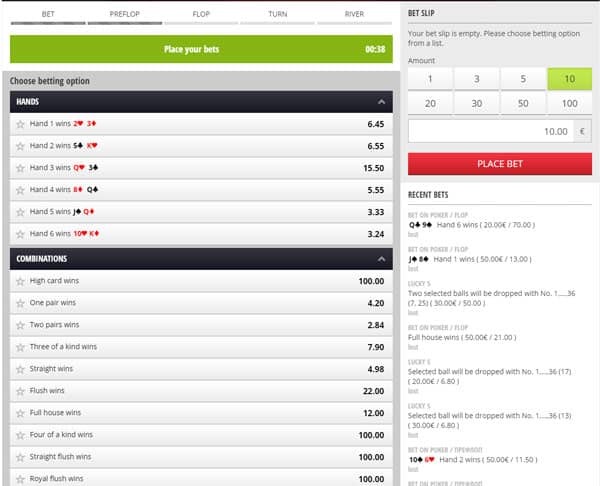 To bet you just select the row, enter the amount you want to wager and press Place Bet. 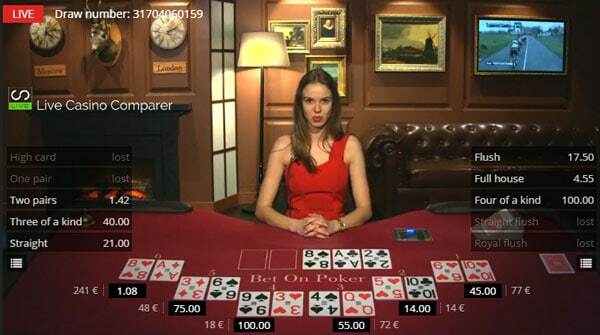 The initial odds for each player position and the hand values are displayed on the screen before any cards are dealt. You can make as many and different bets as you like. The dealer burns the top card in the deck and then deals the Flop. The odds are recalculated and you can bet again. The dealer burns the top card and deals the Turn card. The odds are recalculated and you can place more bets. The Dealer burns the top card and then deal the River card. The winning hand is identified and payouts are made. During the game, if a hand can’t win, i.e it has lost, no more bets will be possible. That’s the same for the combination bets. If a hand can’t be made then you’ll no longer be able to place a bet on it. That’s the same for the combination bets. If a hand can’t be made then you’ll no longer be able to place a bet on it. The playing interface is fairly basic in what you can do. You have the option to display the odds panels or remove them and you can adjust the volume. The whole interface is responsive so the game can be played equally well on a Tablet, Mobile or Desktop PC. 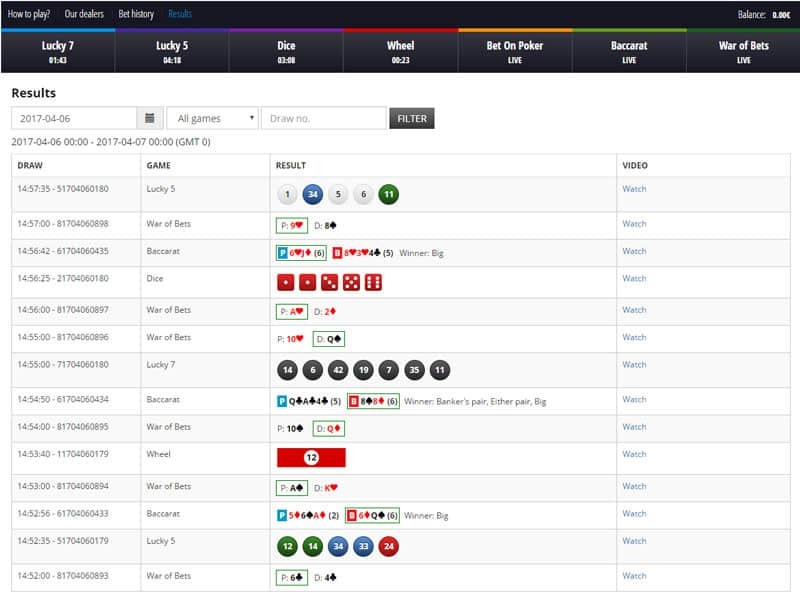 Game results for all Betgames games are published in real time on their website as well as being displayed by the casinos using their games.